I first heard about Eldorado from a friend in Seattle area. 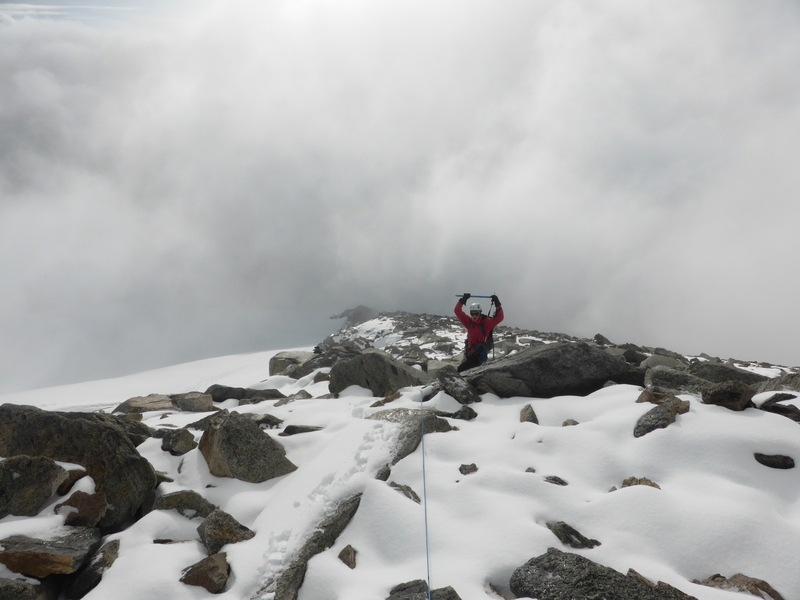 The photo of the snow arete instantly grabbed my attention and after a bit of homework, it was added to my short list of objectives for near future. Eldorado is a 2700m peak in the North Cascades region,rising out of Eldorado and Inspiration glaciers in a beautiful area with pointy mountains as the eye can see in either direction. 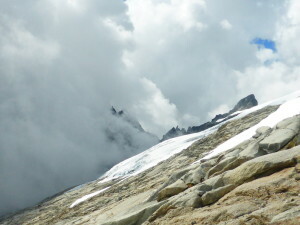 The route gains about 2130m from trailhead to summit, roughly equivalent to Baker,but over less than 10km. 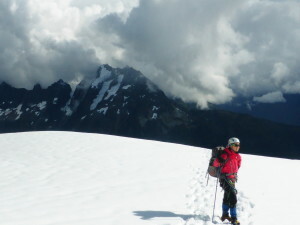 The most photographed feature of the climb is the knife edge , a short final section of the summit ridge that promised a fun but reasonable amount of exposure. Stars aligned to get up there on the Labor Day long weekend. Else and I left Coquitlam around 5pm on Sat and arrived at trailhead in time to pitch a tent and go to sleep. Lateness resulted from my clueless zig zagging through Surrey on the way to the border, followed by the border wait itself. And a stop for pizza in a strangely named town of Concrete, WA,which was actually pretty good, even if cranberry chicken is somewhat unconventional and tastes like pizza crossed with cheesecake. The boulder field that never ends. 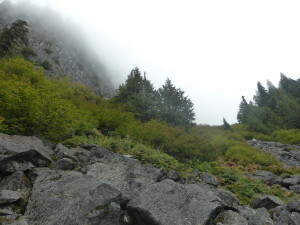 We woke up around 6 to a somewhat cloudy sky and started on the trail after some breakfast and usual faffing. Trail starts with a neat creek crossing over a giant log,followed shortly by a sign that warned us about an unmaintained climber’s trail and told us of a composting toilet(which we never saw) installed at the camping area below summit ridge. We found a confusing number of trails at the start, that all seem to converge shortly after, and the trail leading up through the forest was as good as it was efficient at rapidly gaining elevation. Before too long we reached the next segment of the route : The Boulder Field that Never Ends. 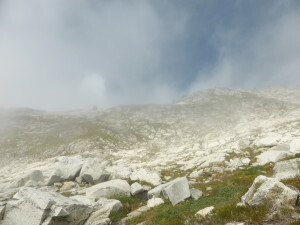 Shortly after entering the boulder field, we also entered the cloud. On the way up we ran into 2 climbing parties, one warned us about rough late season conditions and six inches of fresh snow on the glacier,but also promised sunshine higher up, and the other group folded without making an attempt when they found out their stove is broken. 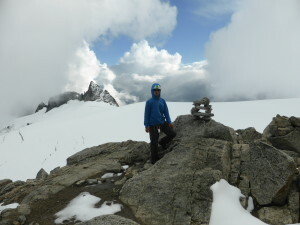 After some more boulder field plod we reached Eldorado basin. Weather seemed to improve briefly as sun peeked at us through the layer of clouds, only to dissapear again shortly. 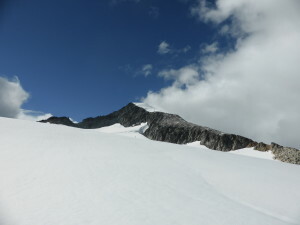 We headed up for the ridge that separates Eldorado basin and Roush basin that we needed to drop into to head towards the glacier. Right after cresting the ridge,Eldorado appeared through a hole in the clouds,it looked close and yet we had no idea how to get to the next section of the route. 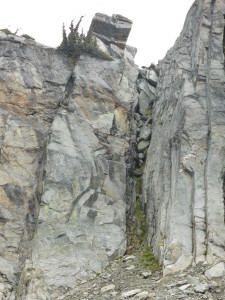 We read and re-read the route description that talks about a class 3 gully and an alternative scramble route down some slabs. We eventually found a gully with several old rap slings, but it was twice as long and three times as scary as what we imagined from the reports. 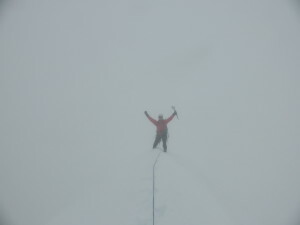 After more fruitless search it was decided we must be high on the ridge. 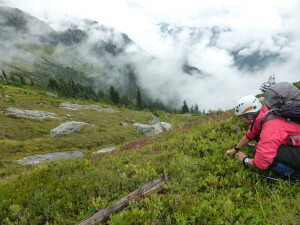 After a bit of backtracking, we regained the ridge at a much lower point and in a moment that was equal parts happiness and facepalm we saw several reasonable ways down. At that point the party of three climbers that was about an hour behind us have caught up and was about to head for the same spot on the ridge as we initially did, so we pointed them the right way. 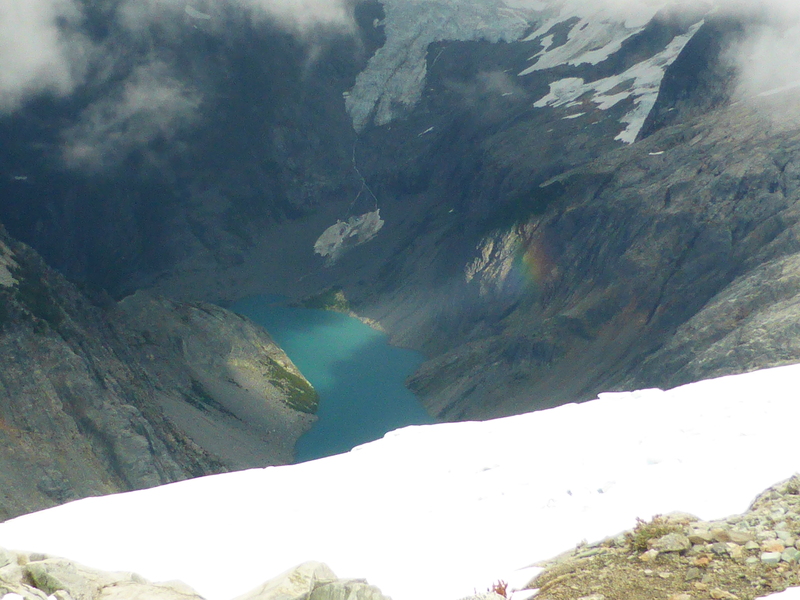 We made our way up the basin towards the glacier and ran into another climbing party that was departing. They also did not summit and told us about crevasses and a questionable snow bridge. 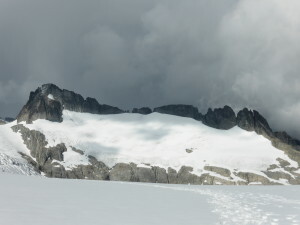 Their camp was on a little snow field at the base of the glacier. We weighted the options and decided that summiting the same day was not realistic given time and warm temperatures, but high camp was much more appealing than low camp on the snow field. The party of three just behind us stayed at the low camp and we did not see them again. The way up the glacier was straight-forward once we made it past the initial section with several small partially covered crevasses. Higher on the glacier the views opened up and we could see our objective as well as Forbidden Peak, Dorado Needle and several others as the clouds came and went. The views only got better as we reached camp. 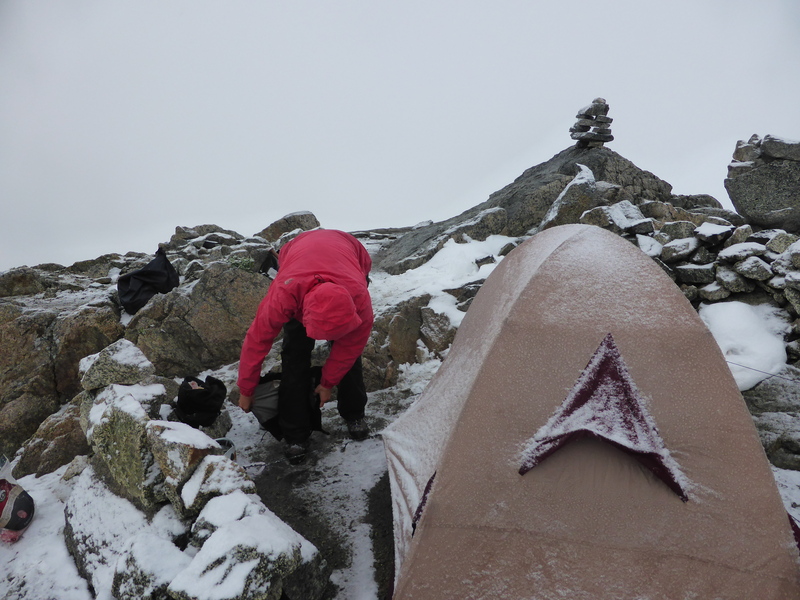 Shortly though, as Else prepared a delicious dinner, clouds rolled in from the west and we got a bit of snow. My contribution to the meal was tea which smelled like smoke due to the clumsy lighting of the stove that also created a fireball which nearly cost me my eyebrows. At some point at night I woke up and heard something wandering about our camp, but was not entirely sure if it was real or imaginery. We woke up to a whiteout and flurries. Else found marmot poo next to her intact food bag, so at least I knew that the furry mountain rat actually visited us at night and I wasn’t crazy. After some lazying around in the tent and trying to decide if we should head up to the summit or back down, we figured that foggy success is still better than the alternative and went up the ridge. Weather started clearing up and we hoped it may continue to do so, but that was not to be.The half-sandwich I had for breakfast quickly felt very insufficient, but after reinforcing that with a power bar I felt much happier about upward progress and life in general. Soon we got to a snow bridge that took us to the boulder slope that bypassed a giant moat. After what should have been a quick detour but felt like forever,we got back onto the snow . The ridge steepened a bit and summit was within reach. 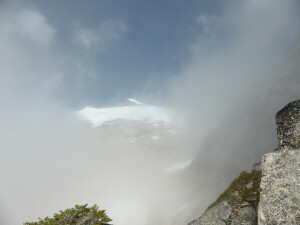 Then we got onto the famous knife edge that took us to the top without incident. Good snow quality made me feel pretty warm and fuzzy about the narrow ridge. Else happy on the summit. Shortly after we headed back down, which went much quicker and more efficient than the way up. The hike back down the glacier was very straight forward and visibility in the basin was pretty good. 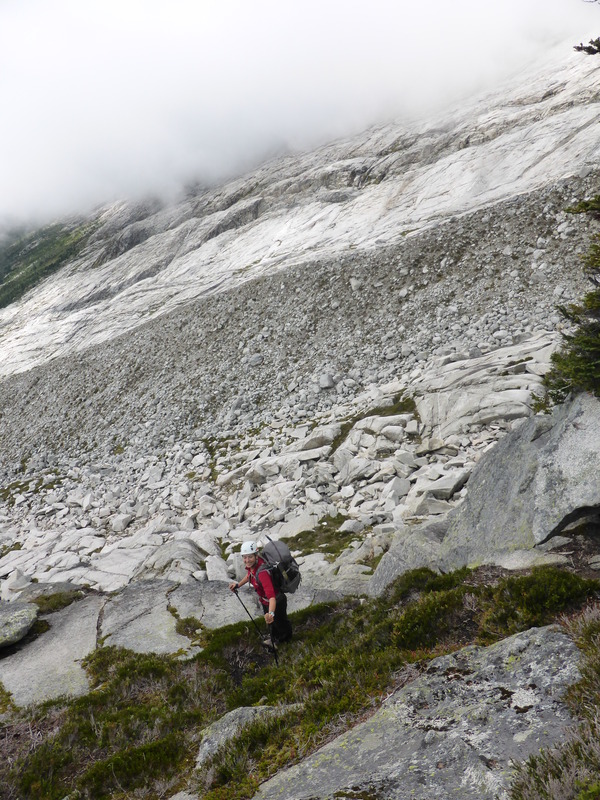 The packs made scrambling back up the ridge a bit more work, but all went well. 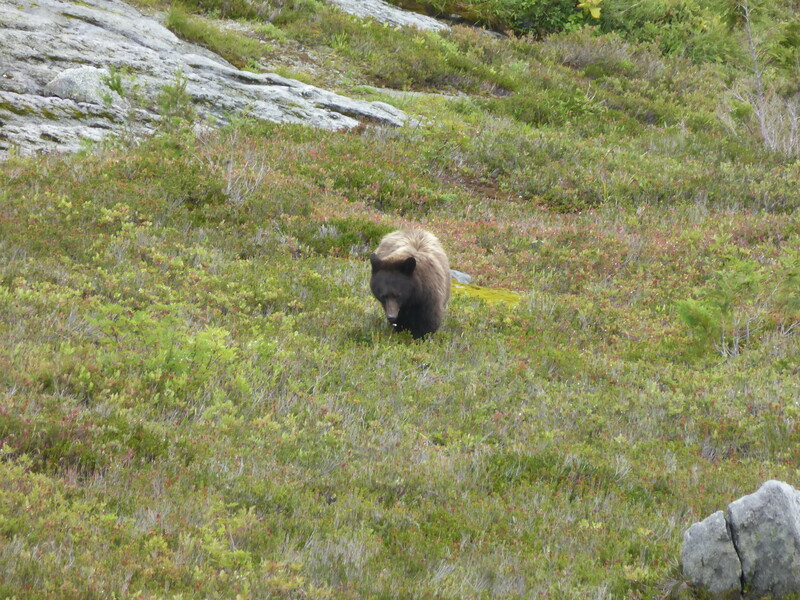 Walking back down Eldorado basin we saw a brown bear grazing on the delicious blueberries that were everywhere along the way. I yelled at the large fuzzy creature and it looked at me as if to say “I realize you exist.I am too busy eating to care”. After deciding we probably won’t get eaten, we walked down the trail which got within 15 meters of the pre-occupied bear. There was another bear off in the distance, equally engaged in chowing down the yummy blueberries. 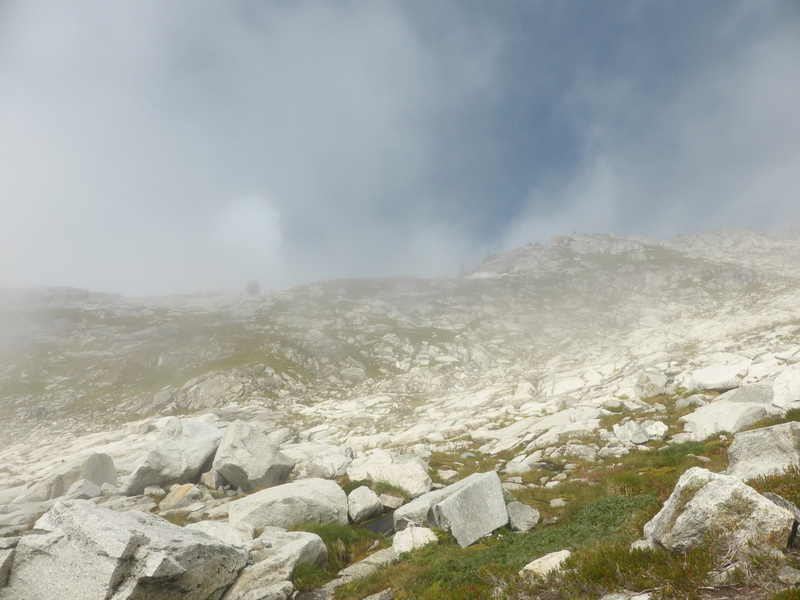 Hiking down the boulder field would have been vaguely annoying if not for many sightings of marmots lounging on the rocks, sometimes in pairs, and pikas hopping about the rocks. We got back down to the car just as it started to rain, had some leftover pizza and made our way back to Vancouver tired but happy . 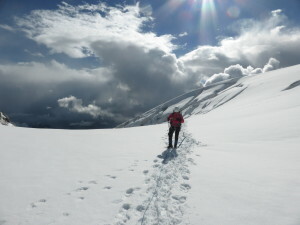 It was a great weekend in the mountains with a full spectrum of weather,terrain and a friendly bear or two. 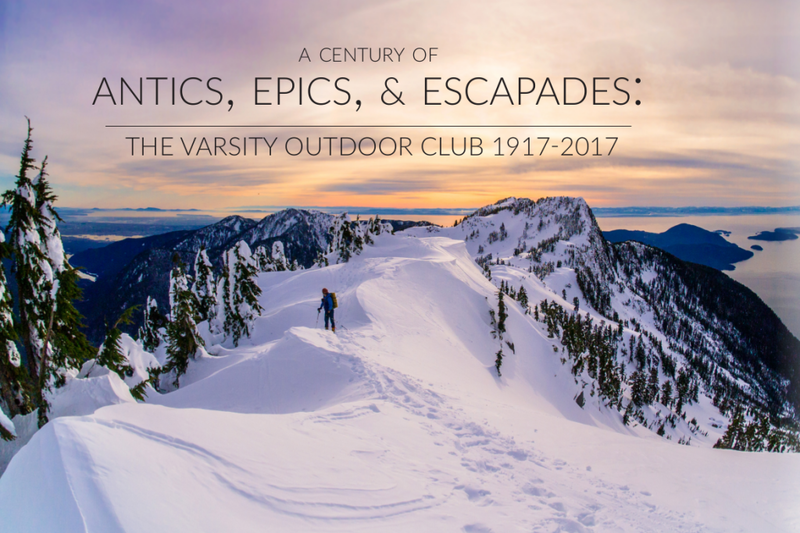 This entry was posted in Climb, Trip Reports and tagged 2wd, Climb, Eldorado Peak, Glacier, hike, Marmots, mountaineering, North Cascades, overnight, Small Group, Snow, summer, Weekend. Bookmark the permalink.